A bridge is a custom-made replacement for one or more missing teeth that literally “bridges the gap.” It uses adjacent teeth next door to the missing space to hold on to false teeth in the middle. A fixed bridge stays in your mouth and you do not remove it on a daily basis. It will act and feel like your own tooth structure soon after placement. It connects the teeth neighboring the missing teeth area to bridge the gap of the missing space and restore your teeth structure. 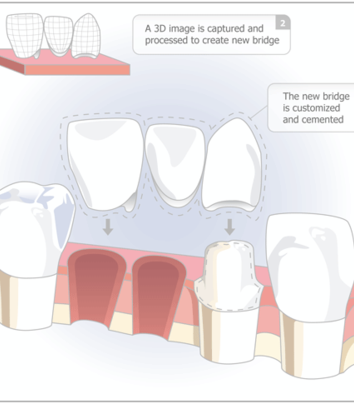 It is important to understand a bridge connects multiple teeth together, so it is essential to maintain cleanliness and excellent oral hygiene around the bridge to prevent decay and gum inflammation.